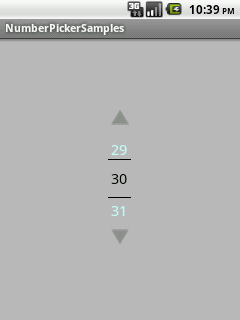 i am new to this, how i can achieve the triangular shaped buttons. Just copy paste it from above everything is clear.. I am new to developement and probably making a basic error but when I use your code - the numbers all apear as TextView and not the numbers - are there additions needed to manifest or somewhere else? @db... the TextView text is only seen in the layout view... once you run the program, the numbers should show up in your emulator. Hello Arrington, have you ever work with smiley in android? 1)Create a Hashmap(key,value pair) and assign an image for each key. 2)Display value of hashmap inside your picker and play with key. I am not sure but it should work..